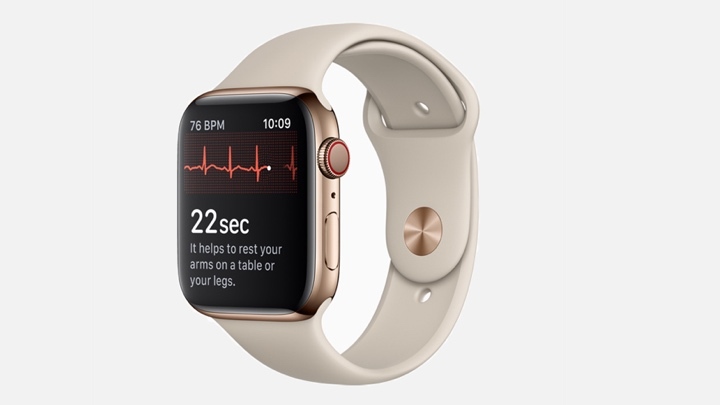 Apple's ECG feature, which was introduced on its Watch Series 4, is finally set to land via a watchOS 5.1.2 software update. Electrocardiograms, or ECGs, enables Apple's latest smartwatch to take a reading from your heart rate using electrodes situated on the rear of the smartwatch and the new Digital Crown. The ECG Watch app can then reveal any abnormal patterns, and the 30-second ECG can be presented to your doctor through a downloadable PDF. The ECG app's ability to accurately classify an ECG recording into atrial fibrillation (AFib) and sinus rhythm was validated in a clinical trial that delivered a 98.3 percent sensitivity in classifying AFib earlier this year. The health monitoring feature has currently only been approved by the Food and Drug Administration (FDA) in the US, but it appears there is a way to access the ECG feature outside of the US, too. It will have to go through a similar approval process in other countries, and it could take a while for it to roll out on a wider scale. In the UK, for instance, it's believed it could take years to be approved, with Apple's smartwatch likely to have to be used in another study as part of the approval process. That would help it get the sign off by the Medicines and Healthcare products Regulatory Agency (MHRA) - the UK equivalent of the FDA. While the ECG support is a feature currently only reserved for the Watch Series 4, the watchOS 5.1.2 update will also bring a new heart rate feature that will work with the Watch Series 1 and later. The new irregular rhythm notification feature will occasionally check heart rhythms and send a notification if an irregular heart rhythm that appears to be atrial fibrillation is identified. The feature was part of Apple's recent Heart Study, with data from that study submitted to the FDA to get clearance for the feature. The all-important watchOS 5.1.2 update is rolling out now, so you should have it on your smartwatch over the next couple of days. Users will be walked through how to use the ECG and the irregular rhythm feature when their watches are all fully updated and ready to get monitoring.